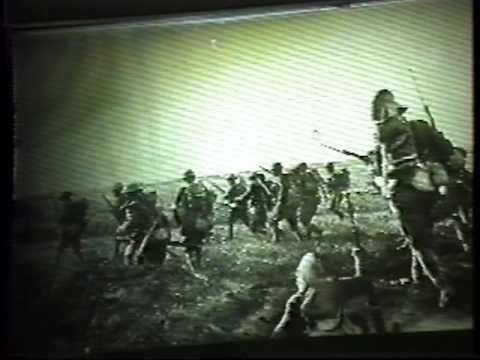 The Battle of Soissons (also known as the Battle of Soissonnais and of the Ourcq (French: Bataille du Soissonnais et de L'Ourcq)) was a World War I battle, waged during 18 July to 22 July 1918, between the French (with minor American assistance) and German Army. Ferdinand Foch, the Allied Supreme Commander, planned a major counter-offensive on 18 July; 24 French divisions, including the Buffalo Soldiers 92nd Infantry Division (United States) then under French command, and reinforced by other Allied troops including 8 large US divisions under US command, and 350 tanks, aimed at eliminating the salient that was aimed at Paris. The Allies suffered 125,000 casualties (95,000 French, 13,000 British and 12,000 American), while the Germans suffered 168,000 casualties. The battle ended with the French recapturing most of the ground lost to the German Spring offensive in May, 1918. 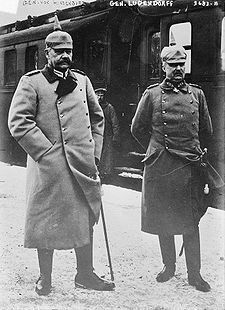 In April 1914 Ludendorff was promoted to Major-General and given the command of the 85th Infantry Brigade, stationed at Strassburg. 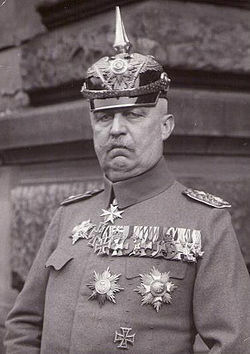 With the outbreak of The Great War, Ludendorff was first appointed Deputy Chief of Staff to the German Second Army under General Karl von Bülow. His assignment was largely due to his knowledge and previous work investigating the dozen forts surrounding Liege, Belgium. The German assault in early August 1914, according to the Schlieffen Plan for invading France, gained him national recognition. The Germans experienced their first major setback at Liege. Belgian artillery and machine guns killed thousands of German troops attempting frontal assaults. On 5 August Ludendorff took command of the 14th Brigade, whose general had been killed. He cut off Liege and called for siege guns. By 16 August all forts around Liege had fallen, allowing the German First Army to advance. As hero of Liege, Ludendorff was awarded Germany's highest military decoration for gallantry, the Pour le Mérite, presented by Kaiser Wilhelm II himself on 22 August.